Thanksgiving is undoubtedly one of our favorite holidays. It’s the opportunity to get together with family and friends, share traditions, express gratitude, and indulge in delicious food and decadent desserts. And let’s be honest: it’s also the ideal holiday for hanging out around the house most of the day, napping or watching TV guilt-free ─ assuming, that is, you’re not the chef! But sometimes, after all the work of planning side dishes, salads and desserts ─ not to mention obsessing over the perfect way to cook a turkey ─ it can be easy to forget one of the most important steps: selecting the best wines to serve for this important occasion. Offer a variety of versatile wines. Finding the perfect wine for a diverse menu and group of guests is nearly impossible. Instead, opt for a selection of white wines with well-balanced acidity to help harmonize some of the richer foods like mashed potatoes and gravy. And go with a variety of fruit-forward reds with lower tannins to complement the flavors of the food. Choose zesty, fresh, lighter wines that will keep guests energized until dessert time. To keep guests from nodding off during what can be a lengthy Thanksgiving meal, it’s best to steer away from the bigger wines and embrace more refreshing, bold fruit flavor options. Try Sauvignon Blanc, Viognier, Gewurztraminer and Riesling for whites; and Grenache, Beaujolais, Zinfandel and Pinot Noir for reds. Remember there are great wines for every budget. Between purchasing appetizers, fresh turkey and all the trimmings, the costs of a sumptuous Thanksgiving meal can add up. Fortunately, you can find great wines that will meet your budget. Great examples under $20 include Eden Valley Riesling, Whitehaven Sauvignon Blanc, Cameron Hughes Zinfandel and Garnet Vineyards Pinot Noir (Monterey County). Ready to celebrate? Reynolds Family Wines offers stellar wines crafted in the heart of Napa Valley; or another local favorite is Jessup Cellars, among many others! 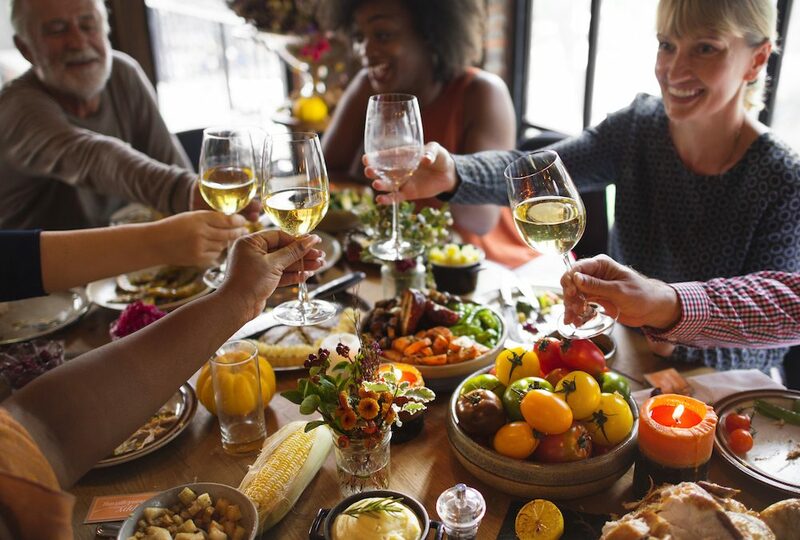 Finishing notes…In the end, Thanksgiving is more about enjoying time with your family and friends to kick off the holiday season in style, than agonizing over the perfect pairing for your food. So feel free to be creative. If you have a younger crowd that prefers bolder reds, include those in your options. Starting the festivities off with a little bubbly is always a good plan – and don’t forget an extra special glass of something for the chefs…they’ve earned it!